Created as the antidote for generic and outdated web courses, Retreats 4 Geeks trains web professionals through a combination of lectures and hands-on activities that ensure attendees walk away with practical skills, not theoretical ones. Lead instructor Aaron Gustafson partners with industry professionals to facilitate training that is progressive and tailored to the individual needs of attendees. Our public retreats are hosted at unique locations across the country to escape over-crowded conference centers, and the small classroom setting enables one-on-one mentoring while encouraging group learning and exploration. 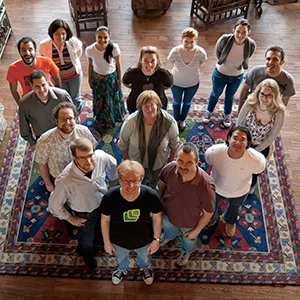 The creators of Retreats 4 Geeks also specialize in on-site training and can customize workshops to suit the needs of your organization’s web team, either in or out of the office. If you can’t come to us, allow us to bring our resources to you. Contact us to find out more details about booking a retreat at your company. What topics do you offer in a private workshops? How much does a private workshop cost? The price varies by the number of days and the trainer(s) you’re interested in. Most start at around US$14,000. How much lead time do you need to set up a private workshop? That’s hard to say. Usually one to two months, but the timing usually comes down to either trainer availability or the amount of red tape we need to get through before the paperwork can be signed. How can I sell my boss on the idea? While Retreats 4 Geeks workshops are hosted in beautiful locations, we provide world-class training to improve your skills. Period. Each of our workshops is taught by industry leaders and practicing professionals with a proven track record of educating web teams. Each retreat is unique. We understand that the web is an ever-changing medium and our curriculum needs to adapt as things change and new best practices are codified; consequently, each event is crafted to highlight current best practices, taking into account the facilitators’ expertise and our participants’ needs. If you have a specific topic you want covered at a retreat, please contact us so we can incorporate your needs into our curriculum. What will the curriculum schedule involve? The first two days of our curriculum typically includes interactive lectures, tutorials, engaged conversations, and presentations of best practices lead by the retreat’s facilitators. The final day is dedicated to a hands-on project where attendees apply the skills they’ve learned, working closely with our facilitators and their peers. But each retreat is different, so it’s best to consult the schedule for the particular retreat that interests you. The retreat fee includes all training sessions, meals, lodging, downloadable slides of presentations (for participants only), event schwag, related literature, and evening activities. Airfare and other travel-related costs are not included. Why such a small classroom size? We believe that maintaining a small classroom size allows for more personal communication and one-on-one attention. Class sizes are capped at between 10 and 20 participants in order to foster a friendly, approachable environment and ensure that every attendee gets the attention he or she needs. Will there be wi-fi and running water? Most definitely! Our retreat locations are remote in order to remove participants from the everyday distractions of life, allowing them to focus on the subject at hand. However, while the destinations may be cozy, the retreat lodges are fully equipped with luxury amenities and modern conveniences. What is the transfer/cancellation/refund policy? In the event that you cannot attend and want to transfer your registration to another person, you must contact us us no less than 3 days (72 hours) in advance with the replacement attendee’s email address and pertinent contact information. We will process the request and a confirmation email will be sent to both you and the person taking your place. Cancellations must take place no less than 2 weeks prior to the retreat and will be refunded at 90% of the original purchase price via the same payment method of the purchase. Persons who notify us of cancellation less than 2 weeks in advance or who fail to attend without notification will be responsible for the full registration fee. Retreats 4 Geeks is not responsible for fees associated with transportation. When will I receive directions to the location? We will provide detailed driving directions, closest airports and other pertinent information in the Attendee Guide for each event once your slot has been confirmed.